Kirby: Squeak Squad's download time is the quickest of any game I've ever played. The download seemed nearly instantaneous, taking under ten seconds and all happening under cover of load screens on all involved systems. You really don't even realize it's downloading. Really. I have only two complaints about Kirby: Squeak Squad. One of these complaints is in regards to the menu system (and the other will be below in the Content category). The opening menu makes you choose a File # (1, 2, or 3). Your progress in the main game (and your progress in unlocking game features) does not in any way alter the Single-Card Download experience. Making players go through selecting a file number is unnecessary. In addition to that bit of minor confusiong, nowhere within the menu system is there a "multi-player" option. You have to go into Sub-Games and then select one (not "Boss Endurance" - if it is unlocked) before it gives you the multi-player option and send a download of all three eligible game at the same time. Why? Overall, the menu was arranged very poorly in regards to the Single-Card Download feature. There should just have been a multi-player option as an alternative to the three files, and then it should ask which game you want to play after the download. Kirby: Squeak Squad has three different games within its Single-Card Download portfolio. The controls in "Speedy Teatime" involve simple screen tapping at the right place and time, which works fine without any problems. The controls in "Smash Ride" are a little mor complicated and it's easy enough to overshoot your target and fall off the stage without being knocked off by an opponent. The controls in "Treasure shoot" can take some getting used to as well and anyone with experience in the game will have a definite edge. No amount of hints can really help someone with no experience, because your timing will take some getting used to. No major complaints in this area, just a higher learning curve for basic functions. The second of my two major complaints fits here in the content section. It is, specifically, a lack of content. The three mini games available through Single-Card Download are short, but they're fun and can actually keep you entertained in consecutive playthroughs. The problem, though, is that the game is capable of so much more content. Very little data is transmitted for this title (hence the short download times) and other features, like a one-level demo or the Boss Endurance would've made this one of the best titles available for Single-Card Download. In the case of the "Boss Endurance" sub-game, even if the whole thing is too large to transmit at one time, the feature could've been kept off of the demo download and sent as Vs Play only, one boss at a time (with each boss downloaded after the previous one was defeated). Other than that, the look of the game is excellent: "Smash Ride" and "Treasure Shot" match the main game's graphic style, while "Speedy Teatime" is altered visually so that it makes sense for the game's mechanics. The sound of the game is fine - not great, not terrible, but not necessary. While each of the games is small (file size) and short (time), difficulty options ARE provided. The Single-Card Donwload "Sub-Games" in Kriby: Squeak Squad may be small, but they're fun. They're not the kind of thing hard-core first-person shootin games will enjoy, but that type of gamer won't pick up the title to begin with. They're cute, and they're simple to pick up and play - even for casual gamers and non-gamers; it's a nice way for parents of multi-DS households to play a game against their children for a few minutes in the house or to keep them occupied during a car ride. Despite the "lower" score, I enjoyed these mini games. Now, if they can only add more and fix up the menu issues, they'd have a must-play gem in the Single-Card Download department, like the main game strives for. Fix the menus easier to navigate (why are programmers afraid to put an option in two places within the menu structure?). Make the "Boss Endurance" downloadable, even if you have to download the bosses one-at-a-time in between battles with longer waits. 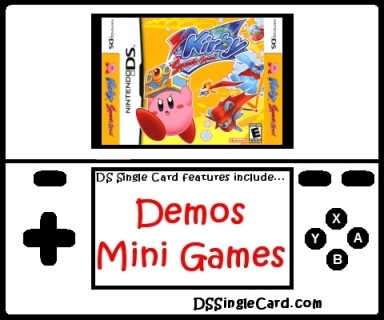 Click here to return to the DSSingleCard.com Kirby: Squeak Squad profile.